Located about 30 minutes north of Belgrano, Center Norte is an entertainment haven for kids, gamers, or anyone looking for a good time. In a structure the size of a large shopping mall, there is a full amusement park that includes a rollercoaster (among other attractions), a 28 lane bowling alley, an endless arcade, a food court, a multiple screen movie theater, and as if that wasn’t enough, the largest IMAX screen in South America. IMAX is a type of cinematic technology that allows theaters to play movies on much larger screens than normal in high definition. Also, some IMAX theaters (including Center Norte) have the capacity to play movies in 3D. I hopped on a bus and headed to Center Norte to view the blockbuster hit “300” on opening night. To say I was impressed would be a gross understatement. In addition to the movie (which was amazing and I would recommend to anyone not grossed out by bloodshed), the IMAX experience was unforgettable. The 26 x 20 meter screen (that’s 85 x 65 ft for us Americans) was colossal, with a crisp picture that was no doubt in high definition; every tiny detail was captured and subsequently magnified. From the hair on the arms of the Spartans, to the grains of dirt on the ground, each minute detail was in perfect focus. The only hard part was deciding where to look, because with a screen so large, I was almost forced to choose which portion of the screen to focus on. I would recommend making the trip out to Center Norte to see an action packed movie for anyone who is staying in Buenos Aires for an extended period of time and loves entertainment. 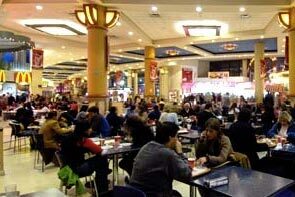 While most large cities worldwide offer amusements similar to Center Norte, it is unique in Buenos Aires. Movie lovers can easily find out what is showing on the IMAX screen here. This is a great complex. This theatre also has been very good about showing animated features in English. All the other movie chains no longer show any animated movies in English. This page rendered in 0.626 seconds.